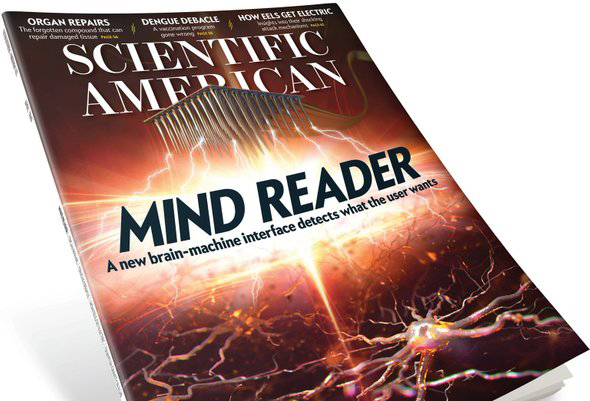 Richard Andersen, a leader of the Center for Neurotechnology’s (CNT’s) Experimental Neuroscience research thrust, has written the cover story for Scientific American’s April 2019 issue. The article, “Machines That Translate Wants into Actions,” gives an overview of Andersen’s research focused on brain areas that formulate a person’s intention to move. Andersen’s lab concentrates on development of brain-machine interfaces for tetraplegic subjects, people who are unable to move either their upper or lower limbs because of upper spinal cord injuries. His team specializes in studying the posterior parietal cortex, where plans to initiate movements begin. By uncovering fundamental neuroscientific principles that explain how the brain operates, Andersen’s team is contributing to improving design of neural devices engineered to assist and empower people with disabilities. For example, study participants in Andersen’s lab have used neural devices to operate a mechanical prosthesis and virtual reality software through their thoughts alone. Read Andersen’s article, “Machines That Translate Wants into Actions” in Scientific American.